Worker tends open hearth furnace at Sparrows Point in this historical photo by the legendary A. Aubrey Bodine. Courtesy of Jennifer Bodine. Today, it’s a forlorn hulk, a remnant of what once was the world’s largest steel-making plant, stretching four miles end-to-end on the Sparrows Point peninsula. Labor Day used to be special for the 30,000 people who worked at the Bethlehem Steel complex at its peak. They churned out cables for the George Washington Bridge, girders for the Golden Gate Bridge and steel for machinery and equipment that helped win World War II. Then after 124 years of operation, it was over. The blast furnaces closed for good in June 2012, the property sold for a pittance to a liquidator. Now there is reason for optimism “The Point” once again might turn into economic gold. 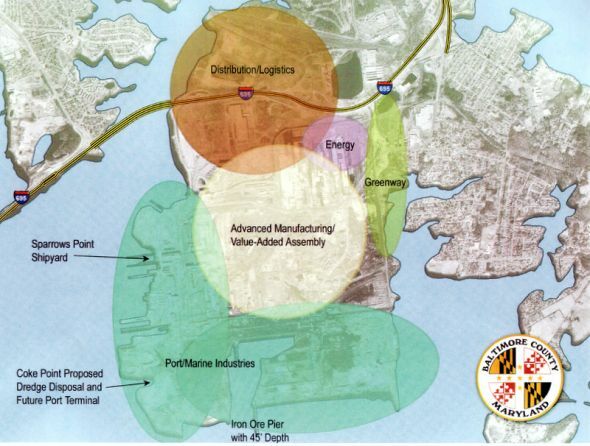 Baltimore County and the Port of Baltimore have come up with pragmatic plans to redevelop this vast acreage — 5.3 square miles — into a major jobs generator. Even better, an investment group with deep pockets and strong local connections is negotiating to buy most of the Bethlehem Steel land in southeastern Baltimore County. Jim Davis heads Redwood Capital Investment, which wants to become the new property owner. Davis’ name isn’t as familiar to readers as his cousin, Ravens owner Steve Bisciotti. The two co-founded a job-staffing service in the 1980s, Aerotek, which morphed into the country’s largest privately held international staffing company — a $10 billion giant called Allegis Group with 12,000 employees and 120,000 contract workers. Its headquarters are in Hanover, not far from Arundel Mills. Davis went on to purchase Erickson Retirement senior living communities and a host of other real estate and financial investments through Redwood. Now he is seeking most of the Sparrows Point acreage. If Davis follows the path laid out by a county task force and the Port of Baltimore, The Point could someday hum with maritime crews, manufacturing and assembly workers, energy operators and distribution and freight employees. It could be the most promising economic development story for Maryland in decades. Nowhere in the Northeast is there such an enormous chunk of land already zoned for industrial use. While 600 acres is heavily contaminated after a century of steel-making, some 2,400 acres won’t need much work to make it marketable. A good part of it overlooks the Chesapeake Bay — six linear miles of deep-water frontage perfectly suited for the port’s expansion needs. If the Maryland Port Administration is to take full advantage of a widened Panama Canal starting in 2016, it needs additional berths for the giant “post-Panamax” container ships (more than three football fields long) that require 50-foot channels and extra-long cranes. Sparrows Point already has a 45-foot iron ore pier that could handle roll-on, roll-off cargo like automobiles and farm equipment; a second pier ideal for barges and smaller vessels; a short-line railroad that links to both CSX and Norfolk Southern tracks, and lots and lots of cargo storage space. There’s also Coke Point, where port officials want to deposit tons of dredged harbor muck over the next decade or two. Once filled in, this “de-watered” land can be prepared for use as a state-of-the-art, deepwater super-cargo berth similar to Seagirt Marine Terminal, which was built on dredged material from construction of the Fort McHenry Tunnel for I-95. That’s just the start of the good news. The task force, appointed by Baltimore County Executive Kevin Kamenetz, thinks some of the peninsula is well suited for an energy park containing a natural gas plant, solar and wind farms, a biomass energy plant and a landfill gas plant. This makes enormous sense. Central Maryland pays heavily to import electric power from out of state. It lacks sufficient transmission lines, too. But The Point already has heavy-duty transmission lines that fed electricity to Beth Steel’s blast furnaces. Clean-energy production would be a nice fit, especially since the facilities wouldn’t be on top of residential neighborhoods. Other uses pinpointed by the task force include innovative manufacturing and value-added assembly for rail cars, ships, marine vehicles, specialty machinery and electric equipment; distribution and logistics parks, and “freight villages” offering warehouse space and service and equipment support. And it may be. Davis has to finalize his group’s land purchase. Then he must negotiate terms with the state of Maryland for the waterfront property. His company will be juggling many development balls simultaneously. Of course, there’s the overhanging environmental concerns that first must be resolved. Eventually, though, The Point might make a surprisingly strong comeback. You couldn’t ask for a better located 5.3 square miles of land — much of it fronting deep water, practically on top of I-95 and the Baltimore Beltway, already tied to major railroads, a short drive from BWI Marshall Airport and at the mid-point of the East Coast’s massive megalopolis. It will take major investments from the state to give the Port of Baltimore these long-lasting advantages. It’s not clear if the state’s next administration will be up to the task or if a political storm will erupt over finding the funds in an already strained Transportation Department budget. But given the department’s botched handling of the CSX freight transfer project – which was needed to allow double-stacking of cargo containers on rail cars – expansion into Sparrows Point is even more important. Environmental cleanups will cost someone a small fortune. It’s a key sticking point that must be resolved. The county will play a role in smoothing the way for interested companies who see the vast potential of Sparrows Point. Baltimore City will have to make accommodations, too, especially in land-use issues tied to redesigning the partial interstate interchange at Broening Highway. It’s too great an opportunity to let slip away, though. For over 100 years, from 1889 until 2012, Sparrows Point was a beacon of jobs and success for the Greater Baltimore region. It can happen again — if there’s the will to make it happen.